As a people of God on the move, we are here making a stop in the temple of the Mother. The presence of the Mother makes this temple a family home for us her children. With generations and generations of Romans, we recognize in this maternal house our house, the house where we find rest, consolation, protection, refuge. The Christian people have understood from the beginning that in difficulties and in trials one has to resort to the Mother, as the oldest Marian antiphon indicates: Under your protection we seek refuge, Holy Mother of God: do not despise our prayers when we are in trial, but deliver us from all dangers, O glorified and blessed Virgin. We were taking refuge. Our Fathers in the faith have taught that in difficult times you have to take shelter under the mantle of the Holy Mother of God. In the past, persecuted and needy people sought refuge with high-placed noble women: when their mantle, which was considered inviolable, extended as a sign of welcome, protection was granted. It is the same for us with the Virgin Mary, the highest woman of the human race. His coat is always open to welcome us and shelter us. The Christian East reminds us of this, where many celebrate the protection of the Mother of God, who is represented in a beautiful icon while, by her mantle, she shelters her children and covers the whole world. The monks of antiquity also recommended, in the trials, to take refuge under the cloak of the Holy Mother of God: to invoke her - as "Holy Mother of God" - was already a guarantee of protection and help and this repeated prayer: "Holy Mother of God", "Holy Mother of God" ... Only in this manner. This wisdom, which comes from far away, helps us: the Mother protects the faith, she protects the relationships, saves in the bad weather and preserves from evil. When the Virgin is at home, the devil does not enter. Where the Virgin is at home the devil does not enter. Where the Mother is present, worry does not prevail, fear does not prevail. Who among us does not need it, who among us is not sometimes troubled or worried? How often is the heart a sea in the storm, where the waves of problems overlap and the winds of concern do not stop blowing! Mary is the sure ark in the midst of the deluge. It will not be ideas or technology that will give us comfort and hope, but the face of the Mother, her hands caressing life, her mantle that shelters us. Let us learn to find refuge, going every day to the Mother. Do not despise our prayers, continues the antiphon. When we beg her, Mary begs for us. There is a beautiful title in Greek that says this: Grigorusa, that is to say, "the one who intercedes promptly". And this with eagerness is what Luke uses in the Gospel to say how Mary went to Elisabeth's house: quickly, immediately! 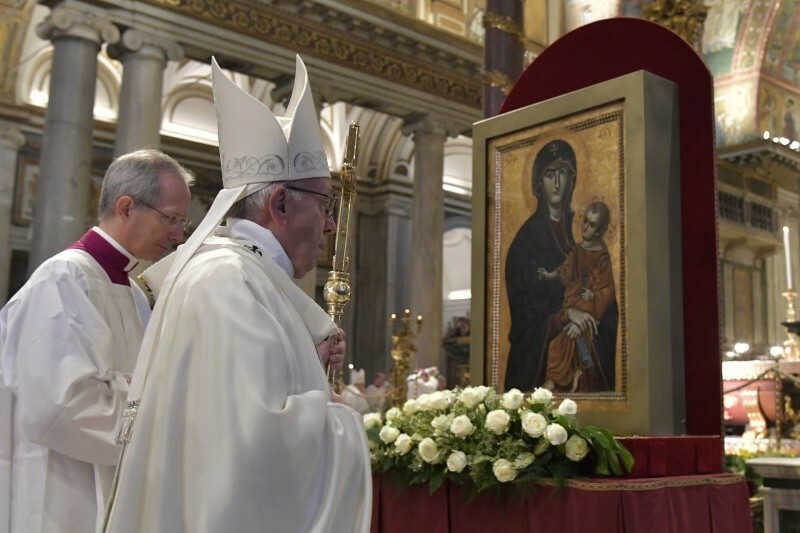 She intercedes eagerly, she does not drag, as we have heard in the Gospel, where she immediately communicates to Jesus the concrete need of these people: "They have no wine" (Jn 2, 3), nothing more ! So does it every time, when we invoke it: when hope fails us, when joy diminishes, when the forces are exhausted, when the star of life is darkened, the Mother intervenes. And if we invoke it, it intervenes more. She is attentive to the sentences, sensitive to the difficulties - the difficulties of the life -, close to the heart. And never, never does she despise our prayers; it does not let down even one. She is Mother, she is never ashamed of us, on the contrary she is only waiting to help her children. An anecdote can help us understand it. Near a hospital bed, a mother was watching over her suffering son after an accident. This mother was always there, day and night. Once, she complained to the priest, saying, "But to us mothers, the Lord did not give a thing!" "What?" - asked the priest. "Take on the pain of our children," replied the woman. This is the heart of a mother: he is not ashamed of the wounds, the weaknesses of his children, but he wants to take them on him. And the Mother of God and ours knows how to take on her, to console, to watch, to heal. rest, like a child to be carried in the arms. It is a great danger for the faith to live without Mother, without protection, leaving us to flounder through life like leaves by the wind. The Lord knows it and recommends us to welcome the Mother. These are not good spiritual manners, it is a requirement of life. To love him is not poetry, it is knowing how to live. Because without Mother, we can not be children. And we, above all, are children, beloved children, who have God as Father and the Virgin as Mother. The Second Vatican Council teaches that Mary is “a sign of certain hope and consolation for the pilgrim people of God” (Const Lumen Gentium, VIII, V). It is a sign, it is a sign that God has placed for us. If we do not follow it, we are wrong. For there is a sign of the spiritual life, which must be respected. It indicates to us “still wandering and placed in the midst of dangers and troubles” (ibid., 62), the Mother, who has already reached the goal. Who, better than she, can accompany us on the way? What are we waiting for? As the disciple who, at the foot of the cross, received the Mother, "took her home" says the Gospel (Jn 19:27), we too, in this maternal house, invite Mary to our home, to our heart, to our life. We can not remain neutral or separated from the Mother, otherwise we lose our son identity and our identity of people, and we live a Christianity made of ideas, programs, without trust, without tenderness, without heart. But without heart, there is no love and faith is likely to become a beautiful fable of another time. Mother, on the other hand, protects and educates children. She loves them and protects them so that they love and protect the world. Let us make the Mother the host of our daily life, the constant presence at home, our safe haven. Let's trust him every day. Let's invoke her in every difficulty. And do not forget to come home to thank her! Now looking at her as she comes out of the hospital, let's look at her tenderly and salute her as the Christians of Ephesus have saluted her. All together, three times: "Holy Mother of God". All together "Holy Mother of God, Holy Mother of God, Holy Mother of God".